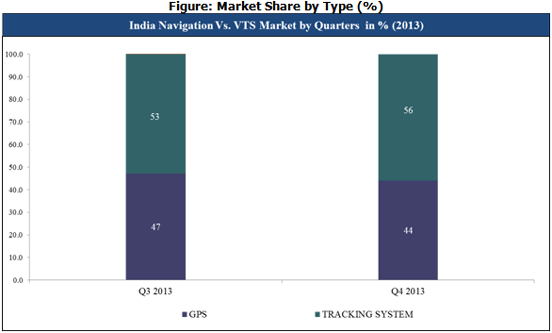 Indian Navigation and Vehicle Tracking System Market shipments volume reached 32,196 units in CY Q4 2013; representing an increase of 30% than the previous quarter. TRIMBLE emerged as the market leader. 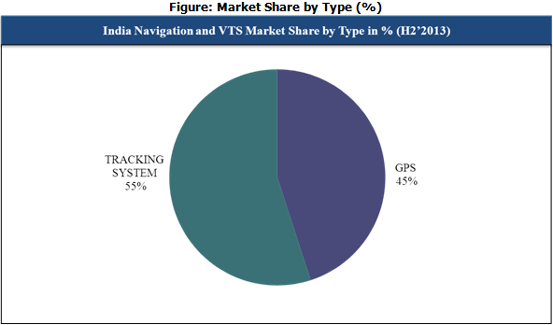 Indian Navigation and Vehicle Tracking System (VTS) Market reported a total Shipment of 32,196 units in CY Q4 2013; representing an increase of 30% as compared to the previous quarter. TRIMBLE emerged as the market leader followed by GARMIN and MAP MY INDIA. In CY Q4 2013, VTS represented 54% of the total market share registering an increase of 33% in terms of unit shipments over the previous quarter. Whereas, Global Positioning Systems (GPS) experienced a growth of 24% in the current quarter. However, VTS accounted for 55% of the total market share in H2’2013. More than 40 vendors shipped Navigation and Vehicle tracking systems. Top three players together constitute 34% of the total market share. Around 22% of GPS are enabled with MICRO SD memory slot. In GPS segment, multimedia feature captured 69% of the total market share. In terms of unit shipments, TRIMBLE witnessed a mercurial rise of 167% which enthroned it as the new market leader in CY Q4 2013. Further, GPS systems with touch screen as a user interface constituted around 95% of the total market share. India’s passenger car and commercial vehicle manufacturing industry is the sixth largest in the world, which is the biggest segment that is helping in boosting domestic demand for VTS devices.